M1’s new mySIM plans to further dilute ARPU, thwarting efforts by other players to stabilise ARPU. Our top pick is Singtel as its core plus digital business is trading at an unsustainable 20-40% discount to M1- StarHub. Hard to see bottoming out of earnings for M1 and StarHub. Maintain FULLY VALUED on StarHub and M1 with lower Target Price. M1 has started to gain market share since 3Q16. M1's revenue market share has been trending upwards since 3Q16 partly due to market share gain of Circles.Life, Singapore’s first full service mobile virtual network operator (MVNO) which launched operations in mid-2016. Circles.Life utilises M1’s network, while M1’s mobile segment includes the former's revenue and subscribers. M1 steadily lost revenue market share, mainly to Singtel between 2014 and mid-2016, dropping to 17.2% in 2Q16 from 18.8% in 1Q14. However, we believe with the successful launch of Circles.Life, M1 has started to attract more market share in the most recent quarters. StarHub's market share mostly driven by handset subsidies. StarHub has also been seeing market share gains over the past few quarters. However, this was mostly due to higher handset subsidies in the latter part of 4Q16 and early FY17. We estimate that StarHub has increased the subsidy for iPhones 8 for the lower-end postpaid subscribers compared to the subsidies it provided for iPhone 7 by ~S$50. Telcos have started to introduce unlimited data plans. In late August 2017, Singapore’s incumbent telcos started offering unlimited data plans to re-contracting/new users. StarHub’s new plans confine unlimited data to weekends and increase package prices by S$2-6. 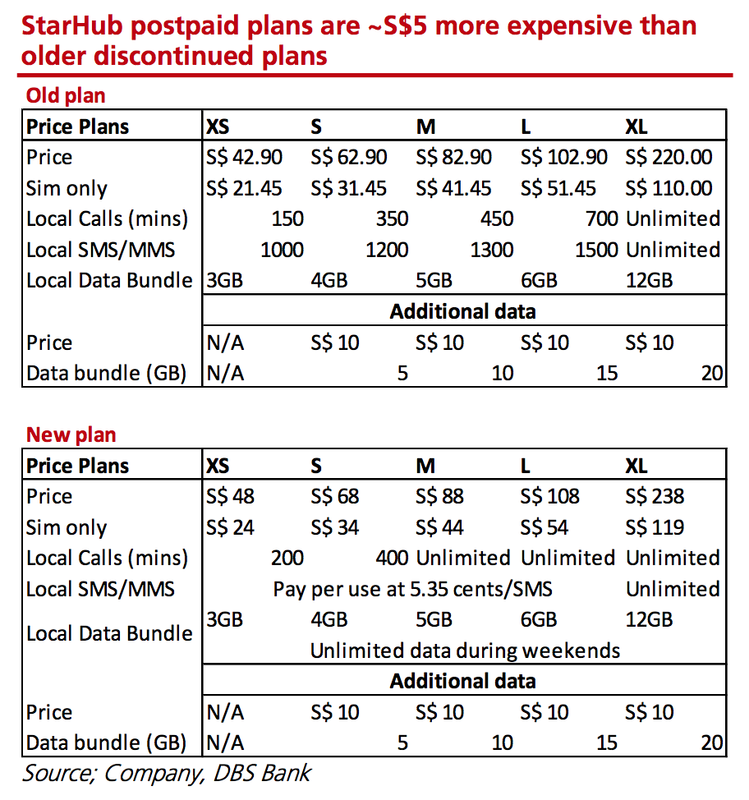 Singtel offers unlimited data plans for its higher-end postpaid packages (starting from S$68.90/month) as an add-on for S$39.90. M1 is now offering the mySIMe plans at a S$20-40 premium to SIM-only plans to factor in the cost of the handsets over the contract period. There is no handset subsidy versus SIM-only plans with the only exception being unlimited data plans. StarHub, Singtel plans are ARPU accretive, to be undercut by M1’s new mySIMe plans. We believe StarHub’s new plans with higher rentals and weekend-only unlimited data would encourage users to re-contract at higher monthly rentals. 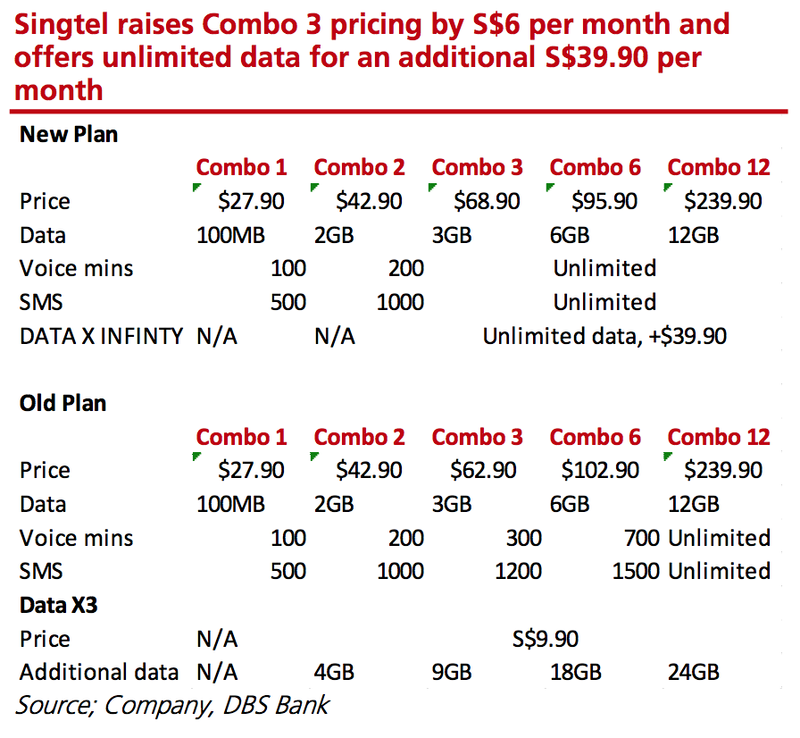 Similarly, by eliminating Data X2 and Data X3 plans, Singtel is leaving subscribers to sign up for the more expensive Data X Infinity add-on. As a result, despite the lower per unit revenue for data, the new unlimited plans are likely to increase the postpaid ARPU of StarHub and Singtel, indicating that the incumbents are less concerned about potential competition from the TPG entrance. However, this may be undercut by the cheaper data plans introduced by M1 which could allow subscribers to switch to cheaper smartphone or SIM-only plans. 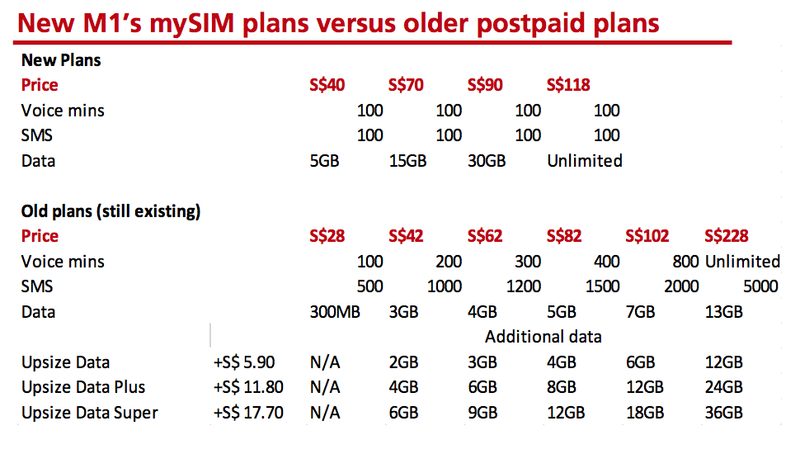 The new SIM-only plans are 20-70% cheaper compared to previous M1 SIM-only plans while its new mySIMe plans allow re-contracting subscribers to switch down and enjoy the same data allowances, albeit with lower voice and SMS allocation. mySIMe plans offer comparable upfront phone prices with better data allocations. M1's new mySIMe plans (with smartphone) offer a much better bargain, compared to the older bundled plans at similar price points (even after considering data upsize packages) for data heavy users, with better data allocation and similar upfront price for smartphones. For example, a 64GB iPhone 8 would cost S$680 upfront with the S$40 mySIMe plans with 5GB of mobile data, while the same phone could cost S$665 upfront with the S$42 Lite+ plans with only 3GB of mobile data. Furthermore, the pricing structure results in minimal to no subsidies at the highest end of the plans which should reduce the handset subsidy costs as users increase uptake of these plans. M1 is adjusting to the new paradigm of lower data pricing in the long term. We believe Singtel and StarHub data plans are mostly focused on improving their revenues by pushing up ARPUs. However, in contrast, the new M1 reflect M1’s long-term strategy of adjusting to the new paradigm of lower data prices, higher transparency and subscriber choice, which will inevitably be introduced once the fourth player enters the market. M1’s MySIMe plans offer much higher data allowances at comparable prices while also showing a clear distinction between what the customers are paying for service vs what they pay for their smartphones. Similarly, by having comparable SIM-only plans as well as retaining their legacy heavy-bundled packages, M1 has left a choice for subscribers unlike other telcos. Though this is likely to cause near-term pain in the market with potential ARPU dilution, M1 also could end up gaining market share in the near term if Singtel and StarHub do not retaliate by introducing new plans of their own. StarHub is trying to grow its enterprise business to offset the decline of other businesses. Since 2H16, StarHub has been showing signs of weaker revenue with mobile and pay TV posting weaker figures. Though enterprise fixed revenues showed bumper revenues in 4Q16, masking underlying weakness of the other segments, it has not been able to show consistently high revenues to offset declining pay TV and mobile. We believe StarHub’s hubbing strategy is starting to weaken with a number of households downgrading from double-play and triple-play services. As this is a critical success factor for StarHub, there could be near-term impact on the company's share price as the structural decline is unlikely to change. Cord-cutting starting to eat into revenues. Pay TV in Singapore has been losing subscribers as more and more subscribers have started to opt for OTT players such as Netflix. However, this did not have an impact till 1H17 as much of the subscriber losses were lower-ARPU subscribers which were largely offset by higher advertising revenue. However, we believe StarHub’s cable segment has started to see the churn of higher-end subscribers which is beginning to weigh down its cable revenue. Despite market share gain, M1's earnings are set to decline. With competition in the mobile segment, M1 is looking to expand its headcount in the enterprise segment in the hope of generating new revenue streams. Along with higher project related expenses, these costs have resulted in an overall increase in M1's operating expenses. The higher headcount and push towards capturing enterprise revenues come amid stagnating revenues which have pushed down M1's EBITDA in recent quarters. The enterprise revenues are yet to make any significant improvement and mobile revenues are likely to contract industry-wide due to the new MySIM plans which should contract M1 revenues going forward. Furthermore, M1’s ongoing network investments and the expanded asset base are likely to expand the company's depreciation costs, which would reduce its earnings in the coming quarters. This should negatively impact M1’s dividend payment, which is set at 80% of earnings. Handset subsidies and dividend payments, being critical factors for M1, should therefore have a negative impact on its share price. Singtel’s Singapore operations remain superior to peers. 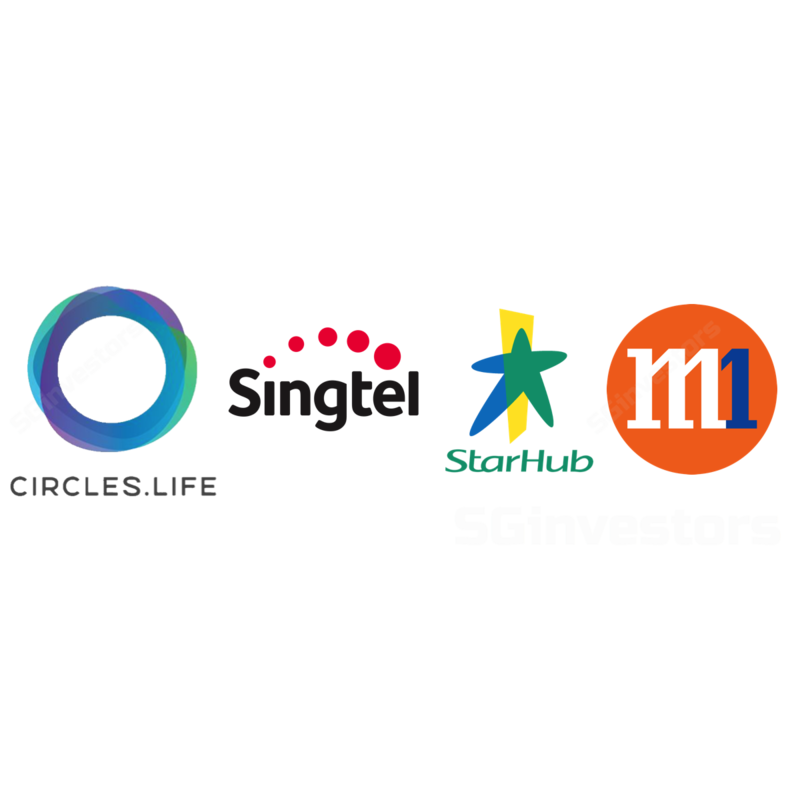 Singtel’s Singapore operations generate over 50% of revenues from enterprise which should enable it to fare better in the near term compared to its peers M1 and StarHub. EBITDA from Singtel’s Singapore operations has shown much better resilience in the first half of 2017, declining only 3% compared to its peers M1 and StarHub which saw declines of 8% and 9% respectively. With EBITDA in Australia growing, Singtel’s total EBITDA is actually up 3.1% over the same period. Circles.Life, Singapore’s first full-service MVNO, launched its services in May 2016 and has so far been successful in addressing its target market of young tech-savvy users who are concerned with mobile data over talk time and SMS. The company provides its mobile services over M1's mobile network as a digital SIM-only postpaid offering with no brick-and-mortar outlets. Though the company has not released any operational data, it claims to have hit 100% of its target market and plans to capture 4- 6% of market share over the next few years. New customers are able to sign up for the service using an online log-in based on their email for a registration fee of S$38 (which can be reduced by ~S$20 using a promo code). Customers are then allowed to customise their basic S$28/month plan with add on options such as 20GB for S$20, unlimited incoming calls (S$2/month) as well as additional data, voice and SMS quotas. Users can add data, voice and SMS for S$6/GB, S$4/100min and S$4/100SMS respectively. However, a 6GB allocation of data is only available for customers who are porting in the existing postpaid number, while those who are complete new sign-ups receive only 4GB of allocation. Circles.Life also offers unlimited WhatsApp use (excluding video calls, 10,000 minutes of voice calls) without impacting data bundle, while also includes free caller ID. Furthermore, Circles.Life has been regularly offering additional data quotas for customers through various programmes as loyalty rewards, which can be substantial. The service also allows new users (those not porting in) to select their telephone numbers (known as golden numbers) for a fee of S$388 each. In addition, Circles.Life also allows users to buy smartphones with no upfront costs and claims to provide ~S$500 savings in the long term compared to 2-year contracts from incumbents. Following the signup process, Circles.Life customers receive their SIM cards over mail, fulfilled by SingPost. The user gets to choose the time of delivery, but there is a S$6 surcharge if the delivery is scheduled over the weekend. Circles.Life also allows users to manage their subscriptions freely by using a smartphone app. This gives users extra visibility and control compared to traditional postpaid services where users only see their bills at the end of the month and need to visit outlets to manage their subscriptions. In addition, to reduce overheads, Circles.Life relies on chat or voice mail for customer care instead of a 24/7 call centre and is only active from 9am to 10pm. This, we believe would be a major concern for heavy users who rely heavily on their mobile devices for daily activities. Hubbing households and changes in postpaid ARPU are key determinants of StarHub’s share price. In our critical factor analysis conducted to understand the share price drivers of Singapore telcos over the past ten years, we have identified StarHub’s hubbing subscriber base to be a precursor of the company's share price performance. Hubbing, or the offering of Mobile, Broadband and Pay TV services bundled together, was StarHub's go-to-market strategy and allowed the company to develop a loyal subscriber base. Hence, changes in hubbing subscribers with subscriptions to all three services, which exhibits a correlation of 0.7 with StarHub’s share price, provides valuable cues on the execution effectiveness of StarHub’s strategy to investors. Changes in postpaid ARPU, an indicator of top-line and subscriber growth, also exhibits a correlation of 0.5 with StarHub’s share price. Dividends per share and handset subsidies are critical factors for M1. Changes in M1’s dividends exhibit a strong correlation of 0.7 with the stock’s past price movements. M1’s dividend policy to pay out 80% of net profits has made interim and final dividend payouts strong proxies for expected changes in the operator’s earnings. For example, the downward adjustment of interim dividends from 7.0 Scts to 5.2 Scts in 2Q17 helps explain M1's recent share price declines as investors readjust their expectations for lower earnings in FY18. Changes in handset subsidies (defined as the cost of equipment less revenues from handset sales) also help explain M1's share price movements. Increasing handset subsidies for example, often heralds intense competition and squashed margins, leading investors to readjust their expectations. Associate profits and Singapore business are critical factors for SingTel. Singtel’s share price closely follows pre-tax contributions from associates, which account for over 50% of the company's pre-tax profits. Pre-tax associate profits and contributions from Singapore businesses exhibit a strong correlation of 0.8 with past share price movements. Singtel’s share price also closely follows top-line contributions from its Singapore businesses. This is likely because Singapore operations, of which enterprise business accounts for the lion’s share, carry higher EBITDA margins, thereby boosting Singtel’s earnings.